A number of our students have been plugging in to the Pathways for Kids programs!! Below is their mission statement. To create a future for children of all abilities where they are included, valued, and empowered to redefine the world. To encourage children of all abilities to find their passions, maximize their potential, and experience the empowerment that comes from diversity. It is essential that children develop a sense of belonging and a strong foundation of value and self-worth. Pathways is devoted to helping communities gain the knowledge and understanding to appropriately include and embrace children of all abilities and provide experiences and opportunities for children with varying needs to grow, learn, and discover their passions together. Outcomes in learning and achieving success dramatically improve when children are allowed to realize their passions and maximize their giftedness. It is our goal to help children of all abilities find their own unique genius and to learn to cultivate that same potential in those around them. Pathways believes children need to realize the power of ONE to make a difference and has adopted the “children teaching children” or “peer to peer” model as one of the biggest priorities. Pathways considers the ideas and passions of children to be our most valuable resource. If a child is passionate about something and is willing to teach and share it with another child, the value given to both children is priceless. Children no matter what their ability need to be included with their peers and taught to work collaboratively to build, take ownership of, and lead the future they will inherit. Pathways believes all children should be given the opportunity to reach their maximum potential. Those at highest risk for exclusion and failure remain children with disabilities and other more vulnerable populations. The national employment rates for people with disabilities remain at a dismal 37%. This is the worst form of exclusion is the inability to work which then causes a complete dependency on government funding and others to live. Pathways is passionate about obtaining the long-term meaningful outcomes that will give these children a life of independence, the ability to pursue the work they love, and obtain a life of dignity and fulfillment. Pathways actively seeks to build partnerships and to collaboratively invest in initiatives that are designed to produce positive and measurable outcomes aimed at helping all children to lead themselves and others toward success and redefining the world around them. We are particularly passionate about investing in programs and ideas initiated, owned, and led by children. The “Include ME!” program is the initial training Pathways provides to get you started with our programs in your area. It provides training for professionals, parents, students, and anyone else that wants to begin to develop a more inclusive world. 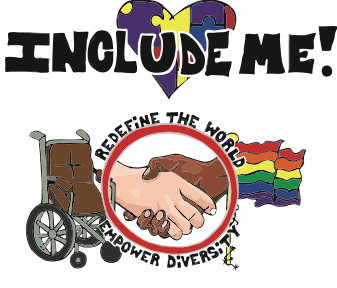 “Include ME!” trains people not to just accept diversity or tolerate it but to become empowered by it! It begins by getting away from a consequence or legally based system like what we see in anti-bullying campaigns. There is nothing motivating about constantly threatening children by what they “can’t do” or the consequences of poor behavior and bullying. The program begins with “Include ME!” assemblies and/or workshops that inspire children with the steps they can take to become more inclusive. After the “Include ME!” assemblies, children volunteer to become mentors and go through the mentor training. Adults help to facilitate programs in areas that the mentors are passionate about and are designed to include children with special needs and others at high risk of being excluded. Once this is underway, the ONE to 1,000 program can begin. This program greatly expands the “Include ME!” program from the initial phase into a youth leadership model where children take genuine ownership and begin to run an entire array of programs from sports and recreation, academics, life skills, and employment training. To read more about “Include ME!” download the brochure below. click here for the home page and more information on Pathways for Kids! Previous Article What’s happening this weekend?